The Mayor of Ards has pledged his support for a new Rare Disease Partnership in Northern Ireland and is urging local people who suffer from rare diseases to participate in a new survey. Councillor Stephen McIlveen has backed the new grouping, which exists to find practical ways of improving the quality of life, treatment and care for those living with rare conditions, following the launch of a survey “Living Every Day with Rare Disease” highlighting the challenges faced by one in seventeen people across Northern Ireland one in seventeen are affected by a rare disease at some point in their lives. 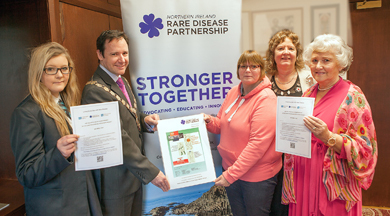 Mayor of Ards, Councillor Stephen McIlveen pictured with Jenna Cupples, Daryl Cupples, Christine Collins and Doris Mason, encouraging support for the Northern Ireland Rare Disease Partnership. “A disease is rare if it affects fewer than five people per 10,000 and that leads to difficulties, from getting a diagnosis in the first place to benefiting from disease-specific support and care networks,” said Councillor McIlveen. “While individual conditions may be rare, that does not make them minority issues and so the Partnership aims to change the outlook for those who must live with a rare disease and offers positive steps to addressing the isolation and frustration they can often experience. The more information the Partnership has, the better it can work for those suffering from rare diseases and I would encourage local people to complete and return the survey”. Chair of the Northern Ireland Rare Disease Partnership, Christine Collins, said: “People affected by a rare disease may need to travel miles – even across to England, France, Germany or further – to get the specialist assessment and treatment they need. But they live every day at home. We are delighted to have the Mayor’s support in working to enable people with a rare condition and their families have the best possible quality of life. Doris Mason, from Comber, said: “I am a volunteer for the PSP Association, which is one of the organisations who have come together to form the Partnership. My late husband suffered from PSP: it took ages for him to be diagnosed, and when he was, it was a very lonely place to be – no one knowing anything of his condition. The PSP Association gave me a lifeline of information and support. The Partnership is taking that to a new level. Together, we can do more to make life better for those affected by a rare disease”.